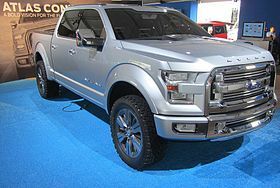 The Ford Atlas is a concept pickup truck that was unveiled by Ford on January 15, 2013 as a preview of the thirteenth generation Ford F-Series, with the most notable change being a switch to primarily aluminum construction. Its features include LED lighting, hidden cargo ramps, all-around cameras, and active aerodynamics meant to improve fuel efficiency at high speeds. The active aerodynamics should improve the Atlas's fuel economy by two mpg. Mileage is improved due to start/stop button and active grille shutters. The weight is unknown, however the next generation F150 based on the Atlas concept may be 700 pounds lighter than the current F-150 due extensive use of aluminum. The interior has blue LED lighting, four air conditioners, a screen with GPS and two cup holders. The Atlas also features leather seats. There is also a backseat with a tiny screen and two air conditioners. The Atlas has 110 volt outlets in the bed. It will also have tailgate steps. The front has adjustable air dams. This feature was added to improve fuel efficiency and improves ground clearance when off-road. Active Grille Shutters will also improve fuel efficiency. ^ Williams, Mark (November 15, 2013). "2015 Ford F-150 spied, shows resemblance to Ford Atlas concept". Long Island Newsday. ^ admin (2016-11-17). "2017 Ford Atlas release date, Interior, Exterior and price - Taaxe". Taaxe. Retrieved 2016-11-24. ^ Chowdhury, Mashfique Hussain (November 2, 2013). "Ford Atlas Concept and F-150 engineers in Dubai". Drive Arabia. ^ Seabaugh, Christian (January 15, 2013). "Ford Atlas Concept First Look". Motor Trend. ^ Vlasuk, Zach (January 15, 2013). "Ford Atlas Concept Hints at 2015 F-150 - Detroit 2013". Kelly Blue Book. ^ Holmes, Jake (January 15, 2013). "First Look: Ford Atlas Concept". Automobile. ^ Sessions, Ryan (January 2013). "Ford Atlas Concept". Car and Driver. ^ Sanchez, Edward A. (January 17, 2013). 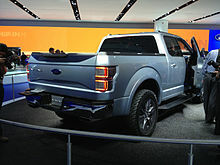 "Ford Atlas: Most Wanted Features For New F-150". Truck Trend. Wikimedia Commons has media related to Ford Atlas.